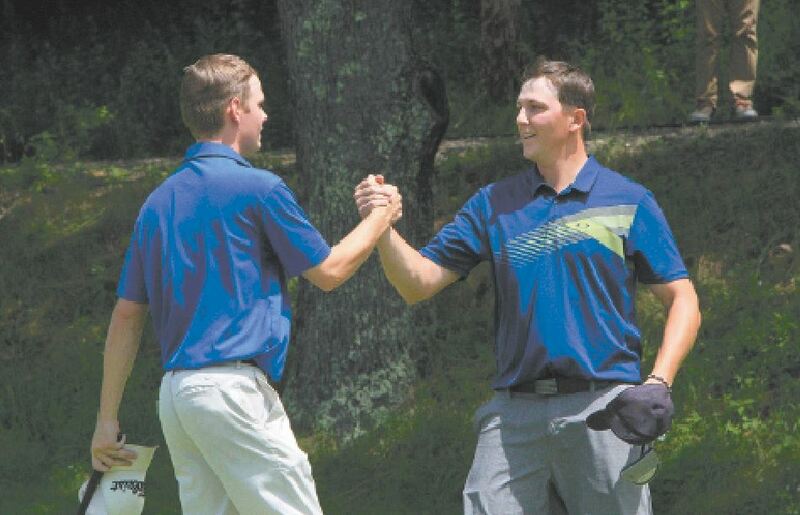 Photo by Jason Orfao Nashua CC’s Mike Martel shakes hands with Concord CC’s Matt Paradis on Saturday following Martel’s 2 and 1 victory in the final to win the of the 114th New Hampshire Amateur Championship at Bretwood GC. 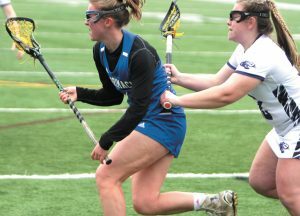 KEENE – It wasn’t easy, but making history rarely is. Nashua Country Club’s Mike Martel held off Concord Country Club’s Matt Paradis for a 2 and 1 victory in the 36-hole title match of the 114th New Hampshire Amateur Championship on Saturday at Bretwood Golf Course. The triumph marks Martel’s second championship in five years, as the 24-year-old New Ipswich resident also won at Golf Club of New England in 2013. He’s the second golfer to earn multiple State Am crowns since the turn of the century, joining Joe Leavitt (2012 and 2014). Martel, the No. 10 seed, went back and forth with top-seeded Paradis during the brunt of the front nine. Paradis – a Southern New Hampshire University standout who also settled for runner-up honors in 2016 – was 1 up through 11 holes, but Martel turned the tables by dropping in birdies on five of the next six and was 4 up at the 18-hole intermission. Martel maintained a cushion throughout the following nine and a three-putt from Paradis on the 28th put the Nashua CC member 5 up with eight holes to play. The cushion dissipated in a hurry, though, as Paradis birdied the 30th before back-to-back Martel bogeys suddenly put the Concord CC member down two with four holes to go. Paradis continued to apply pressure with a birdie on the 33rd, but Martel stopped the bleeding and rolled in a short birdie putt of his own. The pair halved the next two and Paradis ran out of time. It was a bittersweet day for Paradis, who was humbled to reach the final for a second straight year. Martel has little doubt the 21-year-old will be back again. The execution on the course led to a memorable day for Martel. He was a former member at Bretwood GC, and his brother, Luke, caddied the final three days. He had numerous fans in the gallery, including his parents, siblings, girlfriend and some close friends. “It’s almost like playing on home turf,” Martel said. Moments after he clinched history, a few of his clearly confident supporters surprised him with a banner that read: Mike Martel, NH State Amateur Champion with 2013 and 2017 in the corners. “I’m glad I didn’t see that before I won,” he said with a chuckle. The future is bright for Martel, who might follow in 2016 State Am champion Chris Houston’s footsteps and test his game at the next level.